Immunoprecipitation: SERCA2 ATPase Antibody - Samples: Whole cell lysate (0.5 or 1.0 mg per IP reaction; 20% of IP loaded) from 293T cells prepared using NETN lysis buffer. 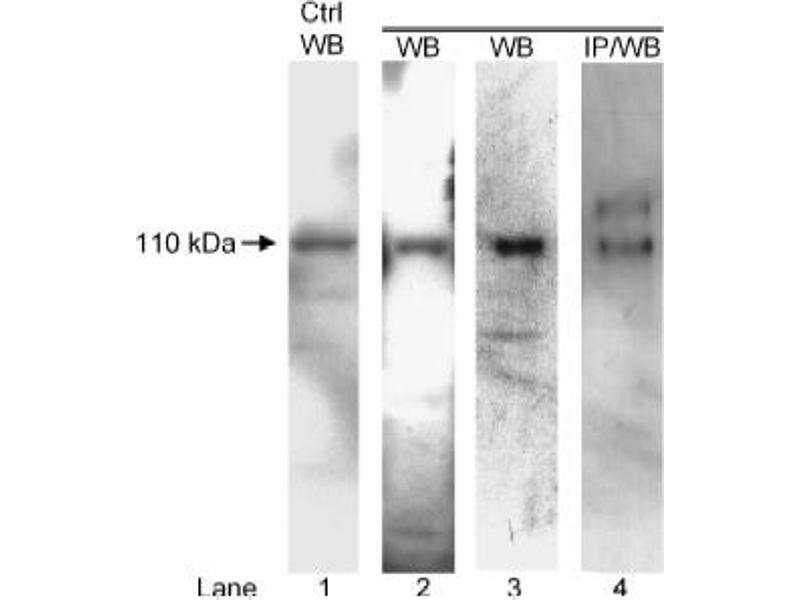 Antibodies: Affinity purified rabbit antiSERCA2 antibody used for IP at 6 ug per reaction. 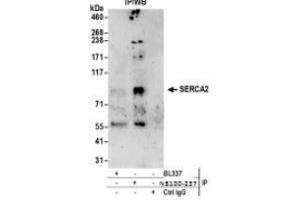 SERCA2 was also immunoprecipitated by rabbit anti-SERCA2 antibody BL337. 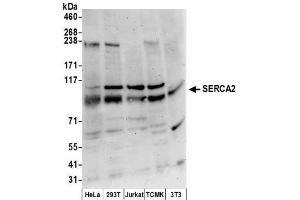 For blotting immunoprecipitated SERCA2, was used at 1 ug/ml. Detection: Chemiluminescence with an exposure time of 3 minutes. 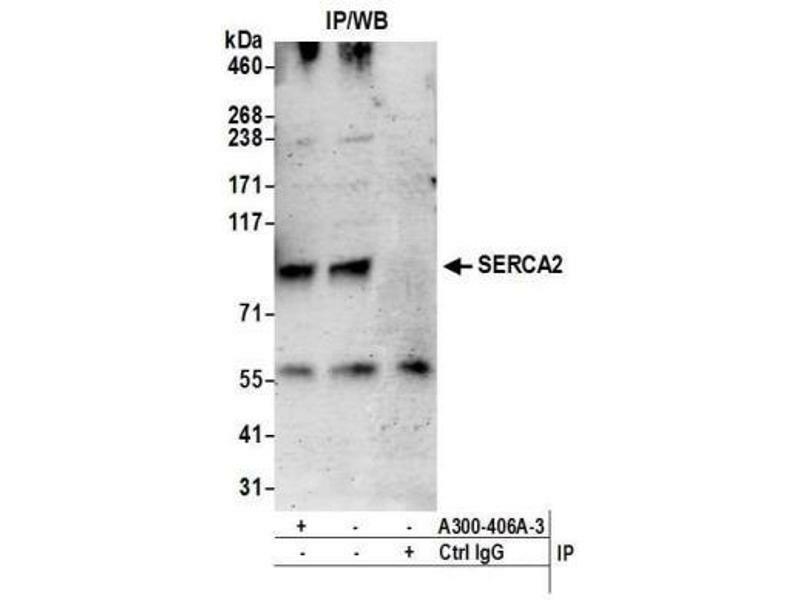 Western Blot: SERCA2 ATPase Antibody - Detection of Human and Mouse SERCA2 by Western Blot. Samples: Whole cell lysate (50 ug) from HeLa, 293T, Jurkat, mouse TCMK-1, and mouse NIH3T3 cells prepared using NETN lysis buffer. Antibodies: Affinity purified rabbit anti-SERCA2 antibody used for WB at 0.1 ug/ml. Detection: Chemiluminescence with an exposure time of 3 minutes. 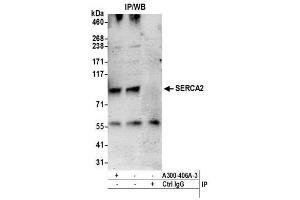 SERCA2 ATPase Antibody - Detection of human SERCA2 by western blot of immunoprecipitates. Samples: Whole cell lysate (0.5 or 1.0 mg per IP reaction; 20% of IP loaded) from 293T cells prepared using NETN lysis buffer. Antibodies: Affinity purified rabbit anti-SERCA2 antibody used for IP at 6 ug per reaction. 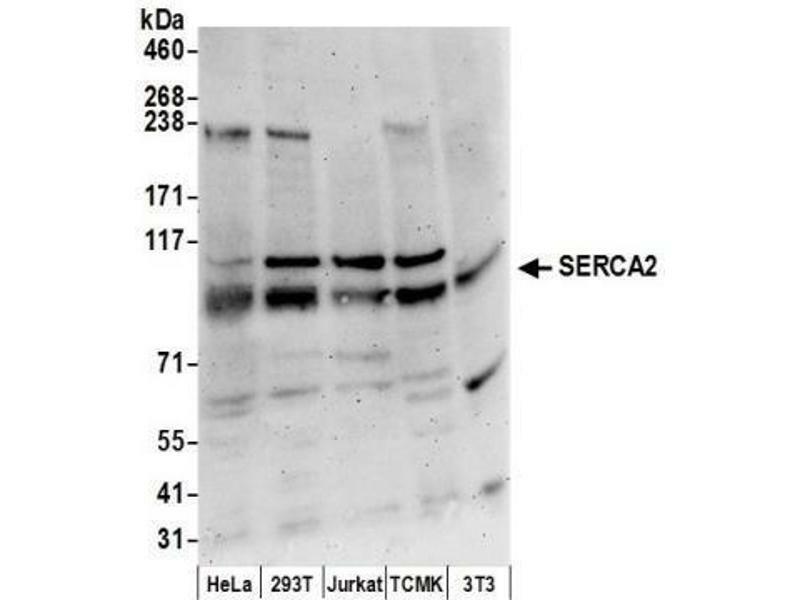 For blotting immunoprecipitated SERCA2 was used at 1 ug/ml. Detection: Chemiluminescence with an exposure time of 3 minutes. Immunogène The immunogen recognized by this antibody maps to a region between residue 475 and 525 of human ATPase, Ca++ transporter, cardiac muscle, slow twitch 2 using the numbering given in entry NP_733765.1 (GeneID 488).